This was an old ugly building that was a KFC and then was proposed as a medical marijuana facility. Some of the community fought back and the dispensary withdrew. Now we have a beautiful facility coming that will bring positive attention to our neighborhood and be a key anchor for more businesses to see value in desire to open up shop. North 32nd, particularly the Shea and 32nd Street area, is becoming a desired location with a much improved walk ability score. 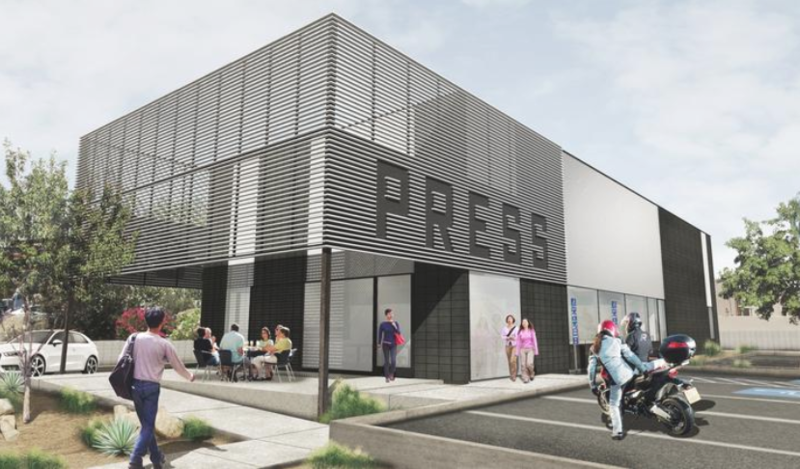 Press Coffee Roasters announced it will build a flagship roasting facility in the 32nd & Shea neighborhood of North Phoenix. The 5,600 sqft facility at 10443 N. 32nd St. will be a full production site for Press Coffee’s whole bean roasting operations. It will also be open to the public with a fully functioning café serving drinks and food with plenty of meeting space. Expected completion of the $3.5 million project is Spring 2019. Co-owners Steve Kraus, Jason Kyle and Alex Mason describe the new roastery as an ongoing commitment from Press to be Arizona’s own local coffee roaster. Kraus opened the first Press Coffee in North Phoenix in 2008 and Kyle and Mason are both born-and-raised Arizona natives. The Construction Zone, LTD will serve as the general contractor, architect and designer. The modern design of the flagship roastery will showcase and educate the public about specialty coffee with viewing areas of the roasting rooms and space for Press’ Coffee 101 tastings. The project will double Press’ production facilities. When the new roastery is open, its current whole bean roastery located in Phoenix will be dedicated for cold brew production. Press plans to expand cold brew production with the addition of a 15-barrel brewing system.